MSI has added another all in one desktop PC to its range with the launch of the MSI Wind Top AE2010. The MSI Wind Top AE2010 features a 20 inch touchscreen LCD display with a resolution of 1600 x 900, processing comes in the form of an AMD Athlon X2 Dual Core processor, and it features an ATI Radeon HD 3200 graphics card with 128MB of memory. On top of that the MSI Wind Top AE2010 comes with 4GB of DDRII 533MHz SDRAM, and a 320GB 5400 SATA hard drive, plus a DVD re-writer and a 4 in 1 card reader. 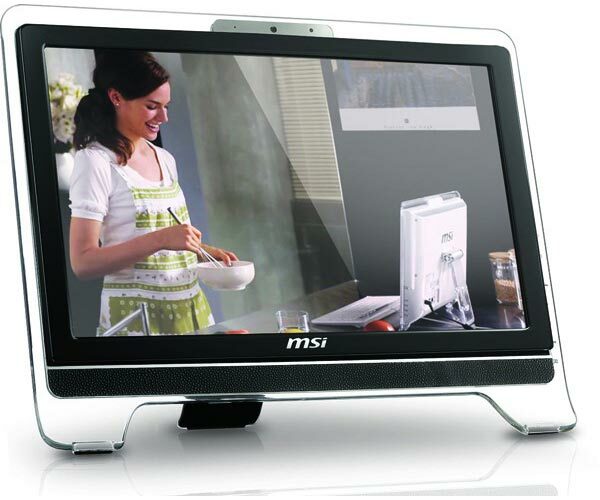 The MSI Wind Top AE2010 has 6 x USB 2.0 ports, 1 x E-SATA, 1 x LAN, 1 x Mic-in, 1 x headphone out and VGA in and VGA out, plus a 1.3 megapixel web camera. If you want one, the MSI Wind Top AE2010 will go on sale next month for $649.99.